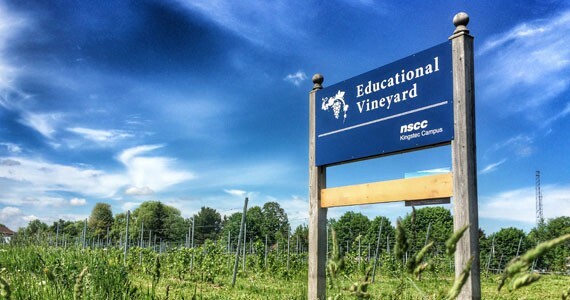 NSCC’s Kingstec campus invests in the next generation of Nova Scotia wine makers. The Nova Scotia Community College's campus in Kentville is bearing more fruit than ever before. Almost 10 years ago, the school was approached by provincial wine industry organizations—folks like the Nova Scotia Department of Agriculture and the Grape Growers Association of Nova Scotia hoped the college would look into the training needs of the industry. Given the campus' location in the Annapolis Valley—the province's vineyard hub—it made sense to get involved. Wine not? Since then, the college has been steadily introducing a fleet of relevant classes. What started out as a singular introductory course to grape growing inspired the growth of an on-campus educational vineyard in 2014. And this year, students will break in the campus' brand new wine- and hard cider-making lab for the first time. 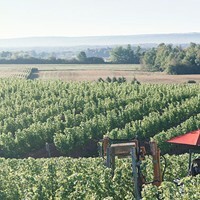 At the moment, NSCC offers two grape growing courses, an introductory and an intermediate course, both taught by Patrick Cantieni, vineyard manager at Domaine de Grand Pré. These courses take advantage of the on-campus access to vines. Bruce Ewert, L'Acadie Vineyards' owner, teaches a winemaking course and Dominic Rivard, owner of Bulwark Cider, instructs a cider making course. Both of these classes will now use the school's lab as a classroom. Janet Specht is the project manager at the Kingstec campus, and she says that these courses are one of a kind in Atlantic Canada. The college's new digs are an upgrade from the prior system of using carboy containers, a method comparable to home winemaking. In the new facility, students will crush grapes with a professional press pad, pour the juice into one of the five large vats, where it will ferment, and be able to bottle and store their wine. The new facility also features a wine analysis lab for taste testing. "It mimics an actual winery," Specht says. "So when students take the courses, it will be like they're working in a actual, real-live commercial winery." Since 2014, Specht estimates the school has trained over 300 people. This time next year, NSCC hopes to offer a new full-time program for aspiring wine and cider makers. But they aren't jumping into anything just yet—matching industry needs is important to the college. Right now, the school and the province's agriculture department are in the process of surveying the grape and wine sector for further information on required training and employment opportunities. "We decided to start small with the sector, and to grow with them," she says. "So we're expecting the results of that survey will show us there's a demand for a full-time program." Bruce Ewert has been teaching the art of winemaking for two decades, and this will be his fourth year at NSCC. Before relocating to Nova Scotia, Ewert was an instructor in the Okanagan Valley. He remembers how much the Okanagan's wine sector accelerated when the local college introduced a program similar to NSCC's back in the mid-90s. "A lot of wine makers who are out in BC now were my students," he says. The accomplished organic winery and vineyard owner sees a similar future for the Annapolis Valley. "The support that the college is giving the industry [here] is substantial." From budding home wine makers to aspiring vineyard owners, and even winery professionals who are looking to spruce up their skills, the Kentville campus offers encouragement and the know-how for all sorts of wine enthusiasts. "And with this teaching winery going in, every class will be a hands-on experience," says Ewert of the new facilities. "The ability to deliver a very appropriate or real experience has just ramped up big time."